With this text we want to provide a basic understanding of the cardiac catheterization (heart cath) procedure and answer some of the more common questions asked by parents.This booklet is a guide for you to follow before, during and after the cardiac catheterization. A heart catherization is a procedure performed in order to obtain essential information about your child’s heart. This procedure helps the cardiac team formulate a clinical plan in conjunction with other diagnostic tests (clinical exam, magnetic resonance imaging (MRI), echocardiogram, electrocardiogram, etc.). All catheterization procedures performed at the Montreal Children's Hospital are done in a catheterization suite (Room C-323) designed for the diagnosis and treatment of children with congenital heart disease or cardiac rhythm disturbances. This special procedure room (also called a cath lab) is equipped with the latest technology. This room is equipped with high-quality imaging equipment and all of the necessary monitoring and emergency equipment. Heart caths are performed by an interventional cardiologist along with a team of specialized nurses and technologists. This cardiologist has received specialized training in pediatric interventional cardiac procedures. He/she will meet with you prior to the heart cath date to explain the specific procedure to be performed on your child. The doctor will also explain the objectives of the procedure, the expected benefits as well as the potential risks. A thin, flexible tube, called a catheter, is inserted into the large vein and/or artery in the groin area (femoral) using only a needle puncture and a thin wire. In certain circumstances, a vein in the neck might be used. Once the catheter is in the blood vessel, the cardiologist guides the catheter into different areas of the heart using fluoroscopic (X-rays) imaging. The movement of the catheter within the heart is not painful or uncomfortable. Blood pressure monitoring in chambers and blood vessels are recorded. Oxygen saturation of the blood in each chamber and vessel is tested. Dye is injected in select areas of the heart and the pictures are digitally recorded. 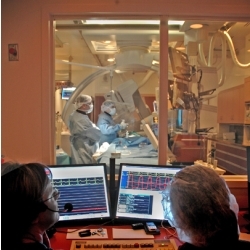 Due to technological advances in the last 20 years, certain therapeutic procedures can be carried out using the interventional catheterization techniques. These procedures may avoid or delay the need for open-heart surgery. In actual fact, the indications for cardiac catheterization simply for diagnosis are becoming increasingly rare. Dilatation (opening) of blocked heart valves using a balloon. Dilatation (opening) of narrowed or blocked vessels using a balloon. Implantation of wire devices, called stents, to treat a vascular obstruction which is resistant to balloon dilatation. Embolization (closing) of abnormal blood vessels and connections in the heart. Occlusion (closing) of holes (septal defects) in the heart with special devices. Obtaining biopsies (sampling of heart muscle). Elimination (by ablation) of aberrant electric circuits which cause cardiac rhythm disturbances. If any of these interventions are planned for your child, the interventional cardiologist will explain the procedure and risks prior to the intervention. This information session would preferably take place in advance of the catheterization date. Also, when indicated, you will be given additional printed material that is specific to your child’s situation. A heart catheterization carries a low degree of risk. This level of risk is influenced by the general health of your child, his/her age, as well as the complexity of the procedure to be performed. You will have the opportunity to discuss the specific risks of your child’s case with the interventional cardiologist prior to the procedure. The cardiology secretary will phone to give you two appointments. The first appointment is for the pre-cath clinic. If it is impossible to arrange a pre-cath visit, then heart cath information can be e-mailed, faxed or given to you over the phone. The second appointment is for the date and time of the heart cath. Meet with the heart cath nurse who will be with your child during the procedure. Your child will see a familiar face the next time he/she comes to the hospital. Assess: Weight, height, allergies, medications, general health, vital signs etc. Discuss the heart cath procedure and have your questions answered. Discuss type of sedation required for your child. Have pre-cath tests done: Chest X-Ray, ECG, echocardiogram and blood tests. Please be prepared to spend at least 2-3 hours at the hospital because there are frequently wait times for some of these tests. Meet with the interventional cardiologist. He will discuss the procedure and its risks. Then he will obtain your written consent for the procedure. Be seen by the anesthesist, if necessary. If your child has a cold, cough, fever or exposure to any contageous disease please call the cardiology department secretary. Telephone: 514-412-4423. She will notify the cardiologist. Your child should eat a good dinner and possibly have a bedtime snack as well. Your child should have a bath before bedtime. Follow any other pre-cath instructions that you received. Report to C-343 (Medical Imaging) at the scheduled time. No formula, milk or food for 6 hours prior to heart cath. No breast milk for 4 hours prior to heart cath. Clear fluids until 3 hours prior to heart cath: Water, apple juice, cranberry juice. Nothing by mouth after this time. It is very important to follow these instructions. Your child’s stomach must be empty so that we may give sedation or anesthesia safely. The procedure may be canceled or delayed if fasting instructions are not followed. You will be directed to the Nursing Room (B-343). If your child is the first patient of the day, the heart cath nurse will be waiting for you. Otherwise, you may be sent to the waiting room. If your child was not seen in the Pre-Cath Clinic, then a physical assessment and tests will be done at this time. An anesthetic cream, which freezes the skin, will be applied to the groin area. The cardiologist will discuss the procedure and then obtain your written consent if this was not already done at the Pre-Cath Clinic. If appropriate, an anesthetist may speak to you as well. Sedation or general anesthesia is used in order to keep your child calm, comfortable and properly positioned during the catheterization procedure. The type of sedation used depends on the procedure being performed, as well as on other factors such as your child's age/weight, ability to lie still, and associated medical problems. You will be told in advance whether sedation or general anesthesia will be used. Please see the additional information enclosed on sedation for your child. Will my child sleep throughout the procedure? Yes. Additional sedation medication will be given through the I.V. as needed. Nurses, in the room, monitor your child and make sure that he/she is comfortable. Patients receiving general anesthesia are closely monitored by the anesthesia team. The procedure takes between two and four hours. You will be given a more precise estimate prior to your child’s procedure. We suggest that parents remain in the hospital while their child is undergoing the procedure. Please wait in the Parent’s Waiting Room adjacent to the Recovery Room on the 10th floor. Use the “D” wing elevators. When do I get a report? When the procedure is finished, you will be called and directed to go to the interventional cardiologist’s office. The cardiologist will discuss with you the results of the catheterization as well as any interventions performed during the procedure. The data and the procedure are also reviewed during a weekly meeting of cardiologists and surgeons at the Montreal Children’s Hospital. The team will keep in touch with you regarding the management of your child’s care. Your child will be moved to the Recovery Room (10D) immediately after the procedure. You will be allowed to stay with your child in the recovery room once the nurses have completed their initial assessment. During recovery, your child will be placed on heart and oxygen saturation monitors until he/she is completely awake from the sedation. Your child may be drowsy or completely asleep depending on the type of sedation or anesthesia given during the procedure. A nurse will frequently check vital signs (temperature, pulse, breathing, blood pressure), circulation, the heart monitor, and the pressure bandage. Patients who are to be discharged home the same day, remain in the recovery room for approximately 6 hours. Your child may drink when he/she is able. The pressure dressing will be removed and replaced with an adhesive strip bandage prior to discharge. Exhibit no bleeding or other complications at the catheter insertion site. Discharge instructions will be review with you by the recovery room nurse. These children will remain in the recovery room for approximately 1-2 hours and then be transferred to the ward (7C-1). Your child will be observed and monitored overnight. One parent may stay overnight at the bedside. Sleeper chairs or cots are provided. It is possible that additional tests such as an echocardiogram or a chest x-ray will be done pre-discharge. The cardiologist will visit and discharge your child in the morning. Discharge instructions will be discussed with you. Do you understand all treatments or medications that you must give at home? Do you have a prescription for medications? Do you have the written discharge instructions? Do you have your child’s Medicare and Hospital card? Day of Cath: Your child should remain in bed, but may get up to go to bathroom. Following day: Quiet activity around the house. Avoid strenuous exercise. After 48 hours: Return to school. Resume normal activities, including sports. No heavy lifting for one month. Start with some clear fluids and then, if these are well tolerated, progress slowly to a normal diet. Your child may suffer some nausea and vomiting for a few hours following the procedure. If this is the case, offer only clear fluids until the symptoms subside. Your child may feel uncomfortable or have a mild fever on the evening of the procedure. Acetaminophen (Tylenol, Tempra) may be given. The recommended dose is 15 mg per kilogram of body weight every 6 hours. Keep the puncture site dry and clean. If the dressing becomes soiled or wet, remove it and wash the skin gently with soap and water. Let the area dry and then apply another adhesive strip bandage. Continue to change it, whenever necessary, for 24 hours. It is normal for the area to appear slightly bruised. The area may be sensitive for a few days, but should not be painful or reddened. A bath or shower is allowed 24 hours after the procedure. In the case of bleeding at the puncture site, apply pressure on the site using two fingers for at least 10 minutes. If the significant bleeding persists despite this maneuver, call “911” for immediate transportation and evaluation at the emergency room. Redness at the puncture site. Phone 514-412-4400 -- dial local 23333. Ask for the pediatric cardiologist on-call. Cardiology nurses Devon Leguillette or Michele Zegray may be reached at 514-412-4400 Local: 23269. Thanks to Dr. Adrian Dancea, Ms. Danielle Desjardins & Dr. Luc Jutras.